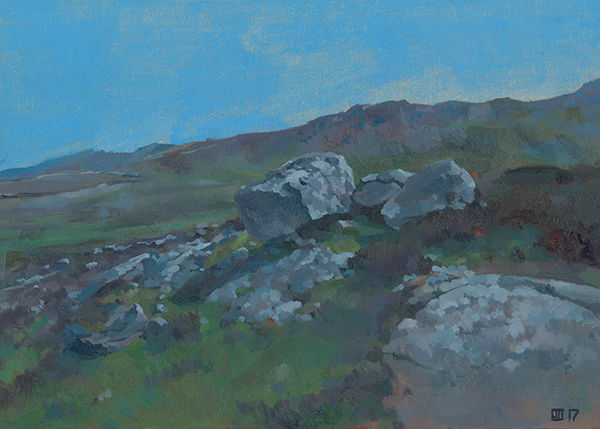 A painting of some of the vast and mysterious blue stones which lie along the Western tip of St David's Head, Pembrokeshire, Wales. These stones rest by a neolithic field system and Coetan Arthur (Arthur’s Quoit) burial chamber from where there are magnificent views in all directions across the wide expanses of the Irish Sea. There is a tangible sense of a mystical, ancient past along this head land, abundant with wild flowers and dancing butterflies, framed by the glittering emerald ocean below the plunging cliff edges. But it was these monolithic slabs of Blue Stone which excited me most. They seemed to hum in the fragrant evening like ancient beacons, their mossy surface warmed by the Spring sunshine from long Winter slumber. Apparently they are Quartz Gabbro, a Basalt rock formed by volcanism on the ancient Ordovician Ocean floor 450 million years ago.